Enter Here for Child's Boots, Shoes. Come on in to round out your costume with that perfect finishing touch!! Medieval and Renaissance Knee Length Boots! 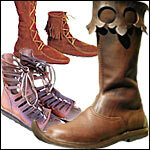 These boots and shoes are made to suite the Living History Enthusiast. They are closer to the original Medieval footwear than most others boots on the market. Renaissance Footwear - Accurate footwear for the Renaissance period enthusiast or re-enactor. Roman Footwear - Accurate footwear for the Roman enthusiast or re-enactor. Suede Footwear - Comfortable suede should do excellent service for just about all periods. Tall Boots for Lads and Ladies from Renaissance to Pirates to Medieval.